For more than 50 years, the Etch A Sketch from Ohio Art Company has provided a creative outlet for both children and adults. Since its release in the United States on July 12, 1960 at a price of $2.99, the toy has sold over 150 million units. It still looks the same as it did when it was first released: a large red frame, white horizontal and vertical knobs, and gray drawing screen. Like its appearance, the appeal of the toy has also stood the test of time. The tagline on the Etch A Sketch’s current packaging says it all: “Sketch, Erase and Sketch Again”. That phrase aptly positions the toy as a “pad” you can draw on forever, without the need for ink, paper, or even batteries. Personally, the Etch A Sketch, along with Merlin, was one of my “go to toys” on long family road trips and extended stays with relatives. 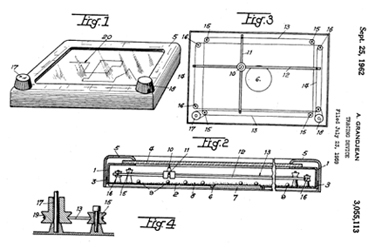 The inventor of the Etch A Sketch was André Cassagnes, a French electrician at Lincrusta Co. He worked in a factory in a northern suburb of Paris and specialized in the production of artificial seat and picture frame coverings. Unbeknownst to Cassagnes, a metallic powder used in production at Lincrusta, coupled with the top of a pencil and static electricity, would lead him to accidentally discover his invention. Historical accounts say that around 1955, the 30-year old Cassagnes was installing a plate over an electrical light switch at the factory. He made some markings in pencil on the translucent protective decal that covered the new plate. After peeling the decal off, he noticed that his markings were visible on the opposite of the decal. Was this an act of magic or sorcery? Sorry Middle-Earth fans, the cause of the phenomenon Cassagnes witnessed was rooted in real science. His pencil had displaced some of the fine metallic particles that were drawn to the decal through an electrostatic discharge. This event served as the spark (no pun intended) of his idea to develop a drawing device that mimicked what he had just seen. 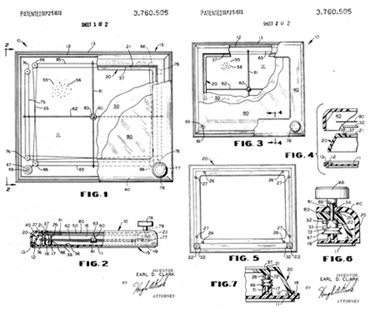 A look at the two primary patents for Etch A Sketch shows the development and early evolution of a toy that remains remarkably unchanged today. The ingenuity behind the toy is revealed in United States Patent #3,055,113, filed July 23, 1959 under the name Arthur Grandjean and assigned to Paul Chaze. N.B. 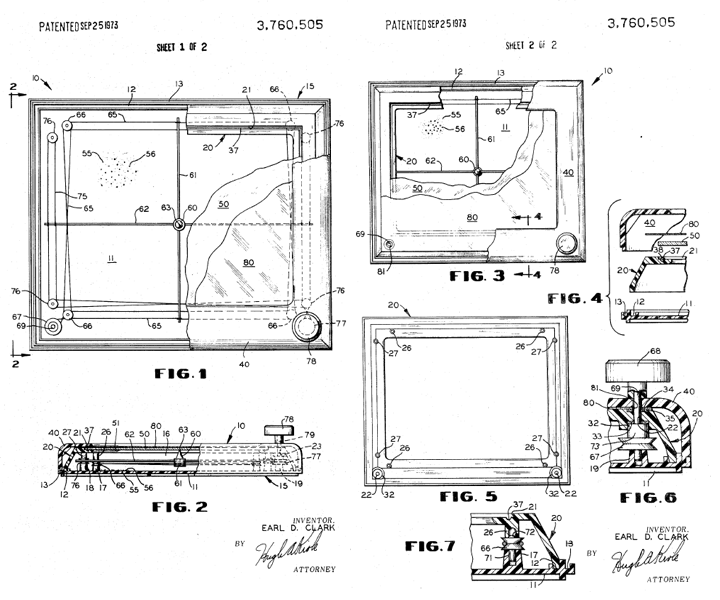 Because the initial patent for the Etch A Sketch was filed by Grandjean, the accountant of one of Cassagnes external investors (Chaze), he is sometimes erroneously credited as the inventor of the toy. The underside of the Etch A Sketch screen is coated with a “pulverulent material such as aluminum powder”. The powder is mixed with tiny plastic beads to prevent it from clumping together. The two knobs control a “movable tracing stylus” hidden beneath the screen. The left control knob moves the stylus horizontally while the right one moves it vertically. The act of turning the knobs moves the stylus through the powder, scraping off powder to reveal vertical or horizontal lines on the screen. Erasing the image is done by simply flipping the Etch A Sketch and shaking it, thereby recoating the screen with the aluminum powder. 13 years later, the Ohio Arts Company made several design improvements to the toy in United States Patent #3,760,505, filed Nov. 17, 1971 under the name Earl. D. Clark. The most notable changes included an improved case that prevented the aluminum powder from leaking ,and the addition of a protective layer of transparent plastic film applied over the top of the glass plate, which made the device safer to use in the event that it was dropped and the glass plate broke. Like most inventors, Cassagnes fine-tuned his invention through experimentation, before finally settling on a concept that utilized glass, aluminum powder, and a joystick to support user-controlled drawing. Cassagnes referred to his invention as “L’Ecran Magique” (Magic Screen). The toy was introduced in 1959 at the annual Toy Fair in Nuremberg, Germany to limited fanfare. However, after a series of negotiations the Ohio Art Company licensed the device for $25,000. Cassagnes worked with one of Ohio Art’s chief engineers to refine the design, replacing the joystick with the familiar two-knob system that operates a horizontal/vertical pulley system beneath the screen. 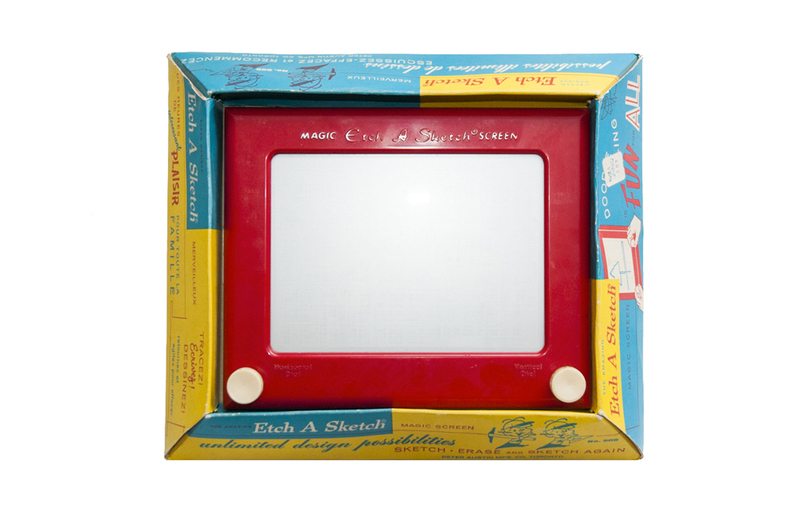 In addition to the industrial design changes, Ohio Art Company also re-branded the toy as the Etch A Sketch. Due to an independent license agreement in his home country, the toy continues to be sold under another name in France – Télécran (Telescreen). Cassagnes coined this term, since the revisions to the toy’s design made it look like another popular household device at the time, the television. The first Etch A Sketch rolled off the Ohio Art production line in time for the 1960 holiday season. It was an immediate hit, selling over 600,000 units and becoming one of the best-selling toys of the year. Some of the initial buzz behind the toy can be attributed to Ohio Art’s shrewd decision to feature the Etch A Sketch in a television ad campaign. In fact, it was one of the first toys to be marketed with that form of advertising. The toy thrived through the baby boom era and, in 1998, was one of the first toys inducted in the National Toy Hall of Fame in Rochester, NY. The accolades continued in 2003, when the Toy Industry Association named Etch A Sketch to its Century of Toys List, a listing of the 100 best toys of the 20th century. The Etch A Sketch will celebrate its 55th anniversary in 2015. Pressure drives the game of Booby-Trap from Parker Brothers – both mechanically and emotionally! Before helping E.T. the Extra-Terrestrial find his way home in 1982, the Speak & Spell from Texas Instruments (TI) made a splashy debut in June 1978 at the Summer Consumer Electronics Show in Chicago.